Turnkey Furnished 2 Bedroom 2 Bath Waterfront Condo is Open, Spacious & Well Maintained. Includes everything you need inside a home, all you need to bring is your toothbrush! Luxurious with Ceramic Tile throughout all Living areas, Lanai, Kitchen & Baths. Plenty of Storage room inside HUGE Master Bedroom closet & Laundry room including HE Washer & Dryer only 1 year old! Newer Refrigerator, and includes all Appliances. 1 Car Carport included and ELEVATORS for easy access to Condo. Relax on your Screened Lanai and enjoy Florida breezes and the Lake View. 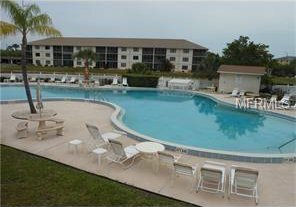 Spend the day lounging by the Heated Pool, Play some Pickle Ball / Tennis, Shuffleboard, or have a Barbeque Picnic by the Lake. Maintenance free condo includes water, sewer, garbage, maintenance & insurance on exterior of building & roof, lawncare and use of recreational facilities. Set back in a quiet community yet close to everything…Newport at St James Place Condo Community in Deep Creek / Lake Suzy area. Conveniently located close to shopping and restaurants. Minutes to Deep Creek Golf Course. Just a short drive to Punta Gorda Airport, historic downtown Punta Gorda's attractions: Fishermans Village, Laishley Park Marina, Parks, Art Galleries & Museums, and Medical facilities. Come see it today and start "Living the Dream"
Listing courtesy of GREEN LION REALTY LLC. Selling Office: BY THE SEA REALTY & INVESTMENT.